I can’t imagine being an only child. What’s it like not being surrounded by a crowd? Never having to vie for attention, whether it’s a subtle tap on the shoulder or a desperate shout of “Look at ME!” How can you have a game of tag? Instead of racing downstairs on Christmas morning, do you casually stroll, knowing that everything under the tree is for you? Do you only play solitaire and not war? Do you go everywhere with your parents, or have real babysitters, instead of your brothers or sisters? What’s it like to wear something that someone else hasn’t worn before? I grew up with three older siblings and four younger ones – yup, that’s eight of us. Six boys and two girls, with me wedged in the middle, fourth child and second girl. We were all tall and skinny, our blue eyes and freckles identifying our connection. The size of a small party, everyone in our neighborhood knew us. We played, we fought and always leaned on each other for support and attention. Sardined into a small house in Queens, New York, we took up every inch of it. 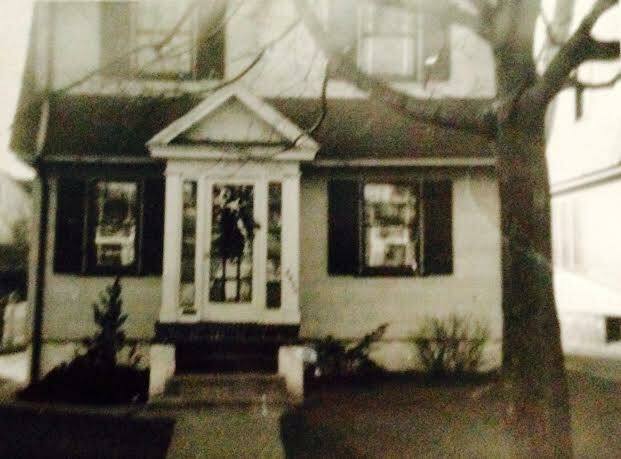 It was a small Dutch colonial, sandwiched between others that were identical, a cement ribbon of driveway separating us. Each house had a brick stoop facing a stamp-sized lawn, scraggly shrubs hugging the foundation. A small vestibule opened into our living room, which led to the dining room and a small kitchen. The upstairs held three bedrooms and one bathroom, which was in constant use. It was a tiny bathroom, with faded white walls and a confetti of black and white subway tiles dotting the floor. Thin towels hung next to a chipped radiator, which sizzled and hissed like a subway grate. The bedrooms weren’t much bigger than the bathroom, the largest one housing four boys. Walking up the stairs to the second floor, it was easy to find the boys’ room, with its permanent odor of dirty socks floating above the landing. It was a wild place in there: clothing flung about, random belts and shoes littering the scuffed floor. A gnawed wooden crib stood against the wall where baby Brian slept, flanked by Bobby’s single bed. My other brothers, Kevin and Timmy, spent their nights in a wobbly double, placed under a window. Next door to this cave, my sister and I shared the smallest room, our bed nearly spilling into the hallway, allowing me to lie in bed and close the door at the same time. A tired maple dresser hugged the wall, festooned with a gray doily running across the top. This tiny room was where my sister found refuge from being the oldest and a girl. Many nights, lying in our little bed, she confided in me. “Can I come?” I always asked. My parents occupied the last room, its walls papered with pink roses and green leaves, yellowed pieces of it curling up in the corners. Dark and mysterious, the metal blinds were usually slanted shut and the air was always filled with the mingled smells of Old Spice and Evening In Paris. 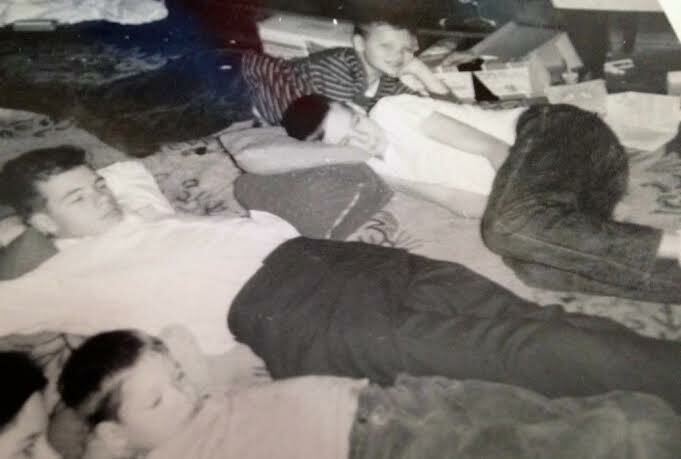 It wasn’t spacious up there, but every night, we all had a pillow to put our heads on. In my self-absorbed child’s world, I had no idea of the stretch it was for my parents to keep our sizeable group afloat. But I knew they never planned for, nor wanted a large family. “What’re you doing with all those kids, anyway?” our neighbor Mrs. Glennon once called over to my mother from her tiny backyard, chatting back and forth while hanging laundry. Our clothesline, with its wooden clothespins standing at attention, sagged with the weight of our belongings and the ever-present collection of diapers. I was ten at the time, and there were six children in our house. Hearing the question, my mother stopped working and put her hands on her hips. And being the polite woman she was, she told the truth. “Well, Helen, we’re just following our church’s rules. And that means no birth control.” My mother’s response quieted our nosy neighbor, but it didn’t help our situation much; two more babies, Jeff and Kerry, appeared after that. My mother became pregnant with my sister Dianne on her honeymoon, and thus began her seventeen-year cycle of having children. I see me standing next to her, looking up at her brown hair that’s been wrestled into a French twist, her cornflower eyes above her smile. She’s always dressed in tired elastic maternity pants, topped by something shapeless and flowery. Her pregnancies usually occurred every two years, but sometimes my parent’s rhythm clicked, allowing my mother to venture into real clothing for short periods of time. But whether my mother was pregnant or not, tired or ecstatic, my father loved her more than life itself. Both the same age, he had married his childhood friend, and called himself “Mr. Lucky.” For many years, Mr. Lucky worked two jobs during the week – one as the manager of a department store and the other as an elevator operator. Weekends, he made extra money tending bar at Herby’s, a local hangout on our corner. We didn’t see a lot of my father – he was busy making sure his family was taken care of. His reward for all that hard work? Coming home to my mother. I imagine feeding this brood was a constant challenge for my mother and father, especially with limited income and growing children. Food appeared and was promptly eaten. No seconds. No leftovers. Our church provided us with our Thanksgiving and Christmas turkeys, and each week the parish school delivered leftover milk and bread to our home. We weren’t the poorest family in the parish, but we were somewhere on that list. My father got a paycheck every Friday, which was convenient, because by Thursday night we had run out of money. Weather permitting, most Friday evenings we all sat waiting for him to return from the city. Perched on our scratchy stoop, we climbed its steps and side pillars like hawks hunting for prey. Eventually, my father appeared at the top of the street, newspaper folded under one arm, a brown bag filled with paper boxes of chicken chow mein in the other. At our house, dinners were fancy on Fridays. Our meals were noisy and quick. Sitting at the long wooden dining room table, we were shoulder to shoulder, my parents at each head and a highchair somewhere in between. Everyone was protective of what was put in front of them; today, many of my brothers still carry the habit of eating with one arm cradling their plate. It was implicit: This is mine; don’t touch it. Once, I was foolish enough to leave my seat during dinner for a bathroom break, learning my lesson when I returned to an empty plate. “I thought you were done!” my brother pleaded to me. Keeping all of us clothed was as big an issue for my parents as feeding us was. The school provided us with free uniforms, which helped dramatically. But for after-school and weekend clothing, hand-me-downs were the rule. My brothers shared a revolving wardrobe, clothes going from one to the other, with some of the pieces growing old with us, becoming part of the family. But since there were five years between my sister and me, hand-me-downs were a problem. Until Barbara Medford moved in up the block. A year older and a lot richer than I was, Barbara had an extensive wardrobe. And every few months, her mother walked down the street to our house, carrying shopping bags filled with clothing that Barbara had outgrown. Coats and shoes and everything in between had been neatly packed into those bags for me. Standing silent, watching my mother thank Mrs. Medford, I wanted to grab the bags right out of her hands. Finally taking my goodies upstairs, I arranged each piece on my bed, admiring and petting my treasures for most of the day. No one but my family knew that I was wearing Barbara’s hand-me-downs. But apparently Barbara did. One afternoon while playing hopscotch with the other eight year olds in the neighborhood, Barbara stopped and pointed at my faded top with tiny pink flowers on it. “That’s my old shirt,” she said with a catlike smile. The other girls stood quiet, watching. I felt my cheeks get hot; I wanted to run home. Instead, I stayed and looked Barbara in the eye. I avoided her after that, and the Medfords eventually moved away. The pressure was gone, but so were the clothes. Besides the hand-me-down’s, the family’s other source of clothing came from my mother’s monthly treks to the rummage sales that took place at the local synagogues. The clothing was inexpensive, and usually of high quality. Everyone benefitted from these monthly wardrobe harvests; besides providing clothes for all of the children, it was also the source of my father’s suits. Leaving early in the morning with one of her older children, my mother stood in line, ensuring she had a first look at the day’s offerings. Hours later, after carting her bargains home in cardboard boxes, she began her sorting process, many of us standing around her. Occasionally, some of the shorts, tops and pajamas that were doled out to me had tiny labels with names sewn into them. “Who’s Susan Fisher?” I asked one day, pointing to a label. The labels never really bothered me, it was the tops and dresses that did. When I wore a garment and perspired, it seemed to activate the camper’s old perspiration; mixed together, it smelled toxic. When I was older and in high school, the stench usually emerged right after lunch. Nervously clamping my arms down, I wondered if the people around me could smell it also. And from that point on, no matter how many answers I knew, my arm wasn’t going up. “It’s embarrassing!” I told my mother. Mary Ann Cooper is a writer concentrating on memoir and personal essays. She has recently been published in Salon, Halfway Down The Stairs, Brain, Child Magazine and Literary Brushstrokes. She is presently at work on her memoir, “The Hollis Ten,” a group of stories about growing up in a family of eight children in Queens, New York. Today, she is comfortable in crowds and still never leaves her plate unattended. Mary Ann resides in Westport, Connecticut.